Between 2000 and 2001, the towns of Taunsa and Toawala and the Changa Manga forest in Punjab were home to large colonies of vultures. An estimated 758 pairs of white-backed vultures flocked to Changa Manga, one of the world’s largest manmade forests. A study conducted by the Peregrine Fund and Ornithological Society of Pakistan found that an estimated 421 pairs lived in Taunsa and 445 in Toawala. 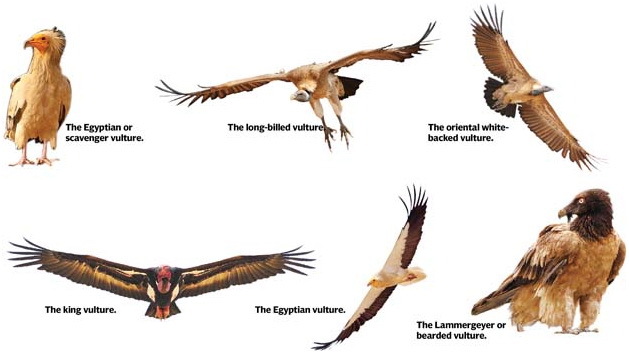 Twelve years later, not a single vulture can be found in these areas. However, the World Wildlife Fund in Pakistan (WWF-Pakistan) is working towards repopulating the skies of places such as Changa Manga by combating the biggest threat to this species: a drug called Diclofenac Sodium. Vultures, known locally as ‘gidh’, are said to be ‘nature’s recyclers’. Their resistance to bacterial and viral diseases means they are able to feast on dead animals, thereby renewing and cleansing the ecosystem. The white-backed vulture species, commonly found in Pakistan, India and Nepal, has declined by more than 99% since the 1990s. Thus, vultures have been mandated ‘critically endangered’ by the International Union for Conservation of Nature, an international organisation working towards conservation of such species. The world is home to more than 20 species of vultures, with Australia and Antarctica the only continents where these birds do not exist. Pakistan is home to eight species of vultures: the Lammergeyer or bearded vulture, the Egyptian or scavenger vulture, the oriental white-backed vulture, the long-billed vulture, the Eurasian griffon, the Himalayan griffon, the Eurasian black vulture or Cinereous vulture and the king vulture. For a bird that is traditionally believed to be aggressive or dangerous, many ask, ‘Why save the vultures?’ Experts from the Indian Save Asia’s Vultures from Extinction program estimate that in the 1990s, there were as many as 40 million vultures in India, consuming roughly 12 million tonnes of carrion annually. With a sharp drop in the number of vultures, this disposal system for dead animals has all but disappeared, thus raising health and environmental concerns. In many cases, dead animals are being sold to the poultry industry so they can be used as chicken feed. Oil is extracted from the intestines of the dead animals and calcium from their bones. With such practices, the risk of human diseases from consumption of such poultry significantly increases, says ZB Mirza, author of A field guide to Birds of Pakistanand visiting professor of biodiversity at Quaid-e-Azam University in Islamabad and Kinnaird College for Women in Lahore. In September 2006, WWF-Pakistan successfully lobbied the government to ban the drug Diclofenac Sodium. The drug is used as a painkiller or to reduce swelling in injured or diseased animals and in 2004, experts found that vultures feeding on cattle treated with Diclofenac died from acute kidney failure within days or were unable to reproduce. The demise of the white-backed vulture (Gyps bengalensis), long-billed vulture (Gyps indicus) and the slender-billed vulture (Gyps tenuirostris) was directly linked with the use of the drug by veterinarians and farmers. Even as the production and use of the painkiller injection was banned in 2006, the drug is reportedly smuggled into Pakistan from China and vets continue to use it. 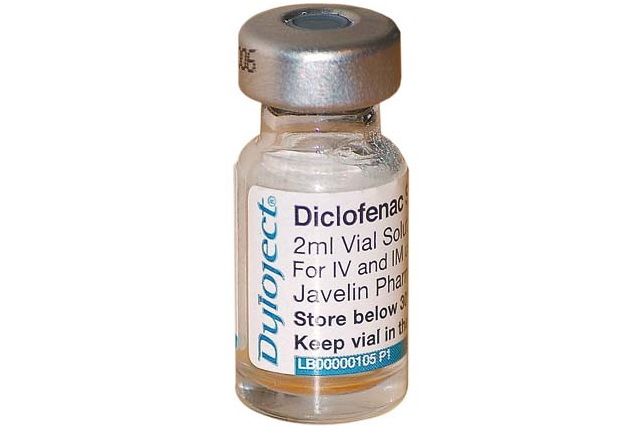 As Diclofenac is also found in pain-relieving drugs for humans, many vets or farmers simply administer this version to sick animals. Experts have suggested the use of an alternate drug Meloxicam, which is being promoted among farming communities and vets, as it is not harmful for vultures. Sensitisation seminars and workshops are also routinely held to educate communities about the damaging effects of Diclofenac. In 2005, WWF-Pakistan released 21 white-backed vultures in a large aviary in the Changa Manga forest and fed the birds a steady diet of donkeys and goats reared on the project’s site. The programme, the Gyps Vulture Restoration Project, intends to replenish the vulture population and once the environment is deemed to be free of Diclofenac, these vultures will be freed. The birds have identification chips embedded in their skin to enable identification. 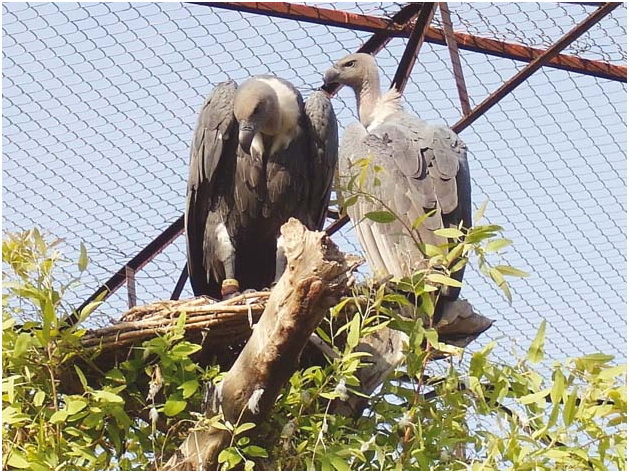 As of 2014, WWF-Pakistan says 14 white-backed vultures live in the Changa Manga restoration centre, which enables captive breeding and the maintenance of vulture population in the area. Sustaining conservation is tough work, WWF-Pakistan says, keeping in mind funding and the fact that this species of bird lays only one egg in a year. 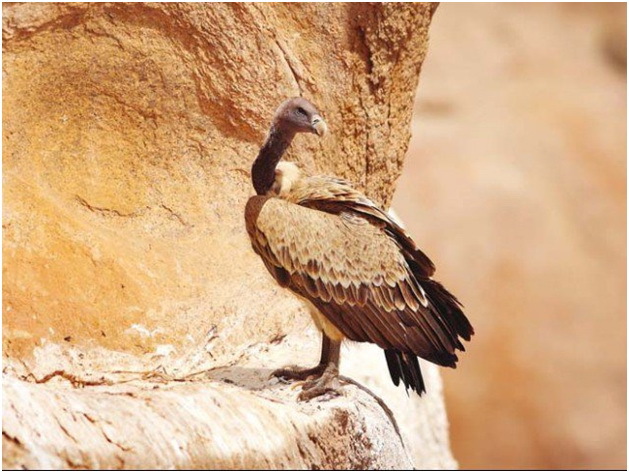 Between 2011 and 2013, WWF-Pakistan found 15 active nests of vultures in Nagarparkar, in Tharparkar, Sindh. In order to conserve the white-backed vultures here, the group set up a protected zone, the Vulture Safe Zone, over 100kms. Free livestock vaccinations and de-worming is offered here in order to prevent the use of Diclofenac while information on better animal husbandry practices is provided to the local farming community. Each summer, 500,000 wildebeests die along the treacherous migration from the Serengeti National Park in Tanzania to the Masai Mara National Reserve in Kenya. And with death come the scavengers, none more important than the vulture. But the birds that once feasted on that misfortune, the janitors that clean the grassy plains, are collapsing — part of a broader decline in vulture populations that throws off ecosystems and illustrates how far-reaching the effects of poaching, poisoning and other human interventions can be. In the first major study of the 30-year decline of Pan-African vultures, a study found that populations of eight species of vultures had declined an average of 62 percent. Seven of those species had declined at a rate of 80 percent or more over three generations, according to the study, published this summer in the journal Conservation Letters. In some parts of Africa, vultures are targeted by poachers who poison carcasses hoping to kill the birds so they will not circle overhead and signal park rangers. A vulture can spot a dead elephant in less than 30 minutes, but it can take a poacher more than an hour to hack off ivory tusks. No vulture, no warning. Here on the Mara, one of the greatest natural strongholds left on the planet, the vultures are not directly targeted but are the unintended victims of poisoning of carcasses that is meant to kill large carnivores, like hyenas, in an effort to protect livestock. Across Africa, the threats to wildlife are myriad, but much of the attention is focused on the stately animals of the savanna, like lions and elephants. Vultures do not make for pretty postcards, and the local authorities are already stretched thin trying to protect the animals that tourists come to see. There are a lot of places along the Mara River that are not as clean as they once were because there are not enough vultures. Researchers say they have seen what happens to an ecosystem when the vultures disappear. In 2000, scientists were dispatched to India, where vultures were dying in great numbers but no one knew why. Everywhere they went, there were dead vultures. But everywhere, their remains were in good condition. The initial hypothesis was that some type of infectious disease was behind the deaths. Soon it became clear that the killer was man-made. A painkiller widely used to treat livestock was poisoning the birds that fed on their carcasses. One carcass with the painkiller in its system could poison hundreds of birds, and by 2006, when the painkiller was officially banned, the vulture population had already declined by 97 percent. Over the same period, there was a drastic rise in cases of rabies in India, with feral dogs taking advantage of the decline in vultures and often spreading the disease to humans. There were apocalyptic scenes, with hordes of wild dogs numbering in the thousands, scavenging the remains of livestock. Estimates vary, but some put the feral dog population in India now as high as 25 million. Roughly 36 percent of the world’s rabies deaths — the majority of them children — occur in India, according to the WHO. The battle against the virus is costing the government billions of dollars. Over tens of millions of years, vultures have evolved into the most efficient cleaners in the natural world. Because of their highly acidic gastric juices, they can eat flesh infected with a variety of diseases without getting ill. When the vultures feast on diseased meat, picking the carcass clean, the threat of wider infection ends. But once the vultures are cleared from the skies, they are very hard to bring back. The vultures, despite their powerful digestive systems, are fragile. Within the first four weeks of their lives, 50 percent of newborn vultures that leave the nest will die. They are naïve. Many fall from their nests, while others succumb to natural causes. In their first year of life, vultures have an extraordinary 90 percent mortality rate. If they survive, they do not become sexually mature until their fifth year. Even then, their reproductive rate is low. In Arizona, California and Utah, the Peregrine Fund and its partners have been working for years to bring back the critically endangered California condor, which by 1987 was almost completely wiped out by lead poisoning, with fewer than two dozen birds left. Nearly three decades later, there are around 400, fewer than half of them in captivity. In Africa, one hopes that the population decline can be halted and reversed before it reaches the kind of critical situation found in India and other parts of the world. The Peregrine Fund has started a program with the Masai people of East Africa to change attitudes about using poisons. It supported a young Masai man, Eric Ole-Reson, to study at Clemson University in South Carolina, and he has since returned to work with other Masai. There are few things more important to the Masai than their cows. They are regarded as movable banks. When a cow is killed by a lion or other predator, it is a threat to a family’s livelihood. So the Masai will poison carcasses in the hope of killing the killers. Inevitably, vultures come to feed and die. The use of poisons started two decades ago when the government provided “a dangerous white powder” to kill feral dogs. A decade later, he started to notice fewer vultures. Now the Masai are worried they are not coming back. In earlier times, the Masai would sing songs to the vulture. The appearance of the bird, long prized for its ability to see into the future, could be a good or bad omen, depending on the context. One song asks the vultures to stay away until a cow dies naturally, at which point they are promised a tasty feast. Conservationists are working to find other ways to help the Masai protect their cows, including the testing of a system of solar-powered flashing lights to ward off predators at night. But other threats to birds of prey remain. The intensive effort to bring electricity to power-starved communities across Africa through the construction of wind farms and power plants as one that, if not carried out carefully, could endanger vultures and other birds. For now, the vultures — which in flight look every bit as majestic as the beloved eagle — continue to play their role in the natural drama that unfolds during the migration. On a recent morning, as first light broke over fields of red oat grass on the savanna, a female lion let roar. A male lion returned the call, and the hunt was on. By the time it was over, five wildebeests had met their end, their carcasses obscured in the tall grass. It took only a few minutes for vultures to begin circling overhead. First two, then a dozen, then scores. They waited until the lions began walking away before swooping in and perching near the carcass. Once the vultures pounced, it took them 20 minutes to pick the bones clean. It seemed efficient. But the job used to be accomplished much faster, by many more vultures. If the vultures continue to disappear, can you imagine? This whole beautiful place will become one stink pit.